Wudtools manufacturers Bread Slicker Knives. Bread Slicer Knives used for slicing of Breads. All blades are precision grounds on bevels and are made as per the requirements of different machines. 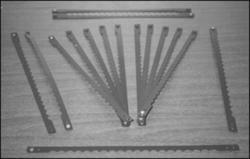 Reciprocating type is available with holes, pins or rivets at both ends. It can also be custom made. Food Grade Teflon Coated Blades are also available. Food Grade Teflon Coated Blades are also available. Looking for BREAD SLICER KNIVES ?